Today, a trip to Hawaii is a simple six-hour flight from the West Coast. But almost a century ago, the first flights to Hawaii required a nerve-wracking and uncertain twenty-six-hour journey to isolated and elusive islands located in the middle of the world's largest ocean. 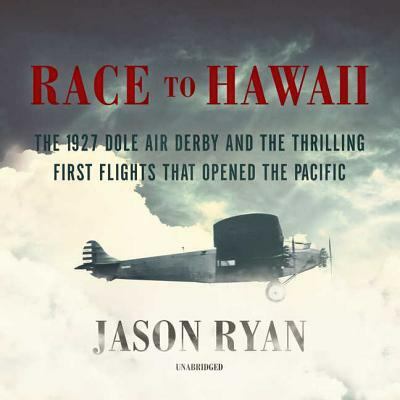 Pilots prayed they would encounter land after flying a full day and night across 2,400 miles of the open Pacific.Race to Hawaii chronicles the thrilling first flights to Hawaii in the 1920s, during the Golden Age of Aviation. These journeys were fraught with danger. To reach the tiny islands, fearless pilots flew unreliable and fragile aircraft outfitted with primitive air navigation equipment. The first attempts were made by the US Navy in the flying boat PN-9 No.1, whose crew endured a harrowing crossing. Next were Army Air Corps aviators and a civilian pilot, who informally raced each other to Hawaii in the weeks after Charles Lindbergh landed the Spirit of St. Louis in Paris.Finally came the Dole Derby, an unprecedented 1927 air race in which eight planes set off at once across the Pacific, all eager to reach the islands first and claim a cash prize offered by Pineapple King James Dole. Military men, barnstormers, a schoolteacher, a Wall Street bond salesman, a Hollywood stunt flyer and veteran World War aces all encountered every type of hazard during their perilous flights, from fuel shortages to failed engines, forced sea landings and severe fatigue to navigational errors. With so many pilots taking aim at the far-flung islands in so many different types of planes, everyone wondered who would reach Hawaii first, or at all.